Shedding light on contemporary Japanese society in an international context, Japanese-Korean relations and modern day notions of a multicultural Japan, this book addresses the broad notions and questions of citizenship, identity, ethnicity and belonging through investigation of Japan’s Korean population (zainichi). Despite zainichi Korean existence being integral to, and interwoven with, recent Japanese social history, the debates and discussions of the Korean community in Japan have been largely ignored. Moreover, as a post colonial context, the zainichi Korean situation has drawn scant attention and little investigation outside of Japan. 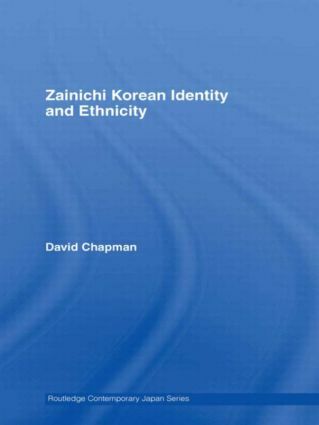 In Zainichi Korean Ethnicity and Identity David Chapman seeks to redress this balance, engaging with recent discourse from within Japan’s Korean population. By taking a close look at how exclusion, marginalisation and privilege work, the book brings insight into the mechanisms of discrimination, and how discourse not only marginalizes individuals and groups, but also how it can create social change and enhance the sense of self. This book will be of interest to students and scholars of Asian studies and of Japanese and Korean politics, culture and society, but also to those with a broader interest in migration studies and the study of identity and ethnicity.